Margaret Zientek testifies before the U.S. Senate in support of the 477 Program. Citizen Potawatomi Nation hums along as Pottawatomie County, Oklahoma’s economic engine, holding new-hire orientation courses every Monday. On average, 10 to 20 employees attend each class before beginning their new positions that week. The Tribe has expanded its public services and commercial enterprises in recent years, and finding qualified applicants in the area has become a challenge. CPN’s Workforce and Social Services programs help Native Americans develop hirable skills. Also known as the 477 Program, it got a boost from updated legislation signed by President Donald Trump in late 2017. Originally passed in 1992 as a demonstration project, Public Law 102-477 contained few parameter details, and the U.S. Secretary of the Interior determined its implementation. The 1992 law solely applied to the U.S. departments of the Interior, Labor and Health and Human Services, and Public Law 102-477 was beneficial for tribal self-governance. The law’s intention was to provide tribes the funds to develop local workforces, serving those who often lived in rural or economically challenged areas under guidance of federal authorities. The law also implemented strict accounting and reporting measures to avoid waste. However, tribes developed as employers and service administrators since its passage, and the law’s limitations became obstacles while providing much needed services. The 1992 law was subject to renewal by Congress, and most tribes found insurmountable challenges during implementation. The law is now permanent and has several provisions developed through consultations with professionals working on the frontline of Indian Country workforce development. The updated law expanded to include 10 additional federal agencies. It also specifically designates a core goal of reducing the often-tedious administrative, accounting and reporting burdens placed on tribes to secure funding. In the spirit of the latter provision, the updated 477 law provides the federal government more latitude in providing waivers and specific appeals processes to tribes attempting to develop workforce development plans, much like their state and local counterparts. The ultimate benefit in this regard is the single budgeting provision, meaning employment, education and training funds may all be included in a single plan. On Dec. 19, President Trump signed the legislation and officially named the Indian Employment, Training and Related Services Consolidation Act, into law. Its signing was the culmination of eight years of advocacy by tribal workforce development professionals and tribal leaders. Unlike almost anything in modern America, the bill received bipartisan support in both houses of Congress. In fact, its provisions were oft-negotiated in three previous Congressional sessions — albeit without passage — that the current 115th Congress didn’t hold a hearing in either chamber to debate its merits. Citizen Potawatomi Nation is one of 43 tribes among 562 to participate in the 477 Program since 1992, which is a testament to both the law’s complicated budgetary and compliance issues and CPN’s skill in managing the reporting aspects. In the 2017 fiscal year, CPN’s Workforce and Social Services Program served 466 adults and 1,186 youth participants. Sixty-one additional clients, including youth and adults in financial need, received assistance covering the cost of necessities. Those served through CPN’s Workforce and Social Services come from all walks of life and live in the Tribe’s service area comprised of Pottawatomie, Lincoln, Payne, and Cleveland counties and a portion of Oklahoma County. This jurisdiction includes services provided for the Sac & Fox Tribe, Iowa Nation and Kickapoo Tribe of Oklahoma. Margaret Zientek, CPN Workforce and Social Service assistant director, has become the Tribe’s workforce development point person under Director Carol Clay-Levi. 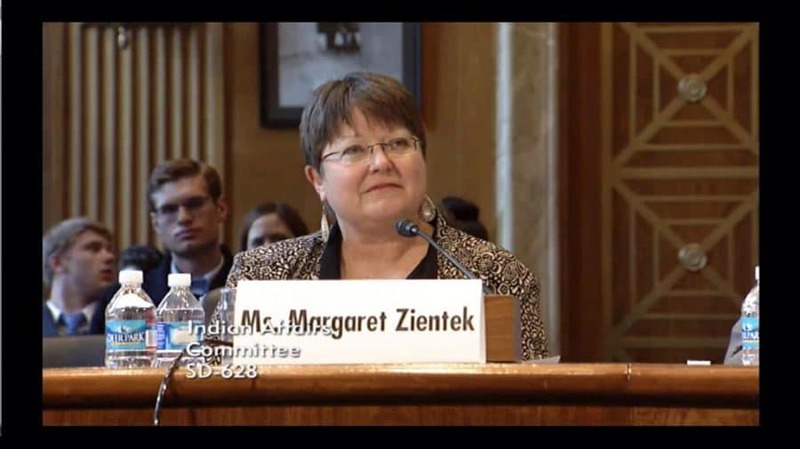 Zientek estimated she has testified before Congress three times in the past 15 years and has given several presentations to the National Congress of American Indians. “My takeaway is that Congress is very supportive of tribal sovereignty, especially Senate Indian Affairs people,” Zientek said. Zientek praised the 477 law’s updates being more effective for tribal nations across the country to implement. “The new law solves several issues determined to be unclear with the U.S. Department of Health and Human Services … (and) expands the federal agencies and grants that can be included in the 477 Program. We have in law that we can now collect full indirect costs (from the federal government),” Zientek said. Previously, indirect costs were typically paid by tribal nations, many of which operate on wafer-thin budgets. With these expanded capabilities, tribal nations in Oklahoma and other parts of the U.S. may begin exploring the feasibility of operating their own 477 Programs. Until then, Zientek encouraged anyone in need of training, continuing education or more information about available services in the Citizen Potawatomi program to get in touch. CPN’s program is open to any member of a federally recognized tribe living within the east-central Oklahoma service areas, regardless of whether they are an adult or a youth. “The goal is to help individuals or households help themselves. We help with unmet needs, and there are limitations, but we’re there to offer a hand up, not a handout,” said Zientek. To learn more about CPN’s Workforce and Social Services Program, visit cpn.news/workforce or call 405-878-3854.